Why does Text Analytics Matter in Customer Experience? Why should you care about text analytics in your customer experience management program? At Clarabridge, we believe that text analytics is the basis of your customer experience management program. And that’s not just because it’s the foundation of our company (which it is, now that you ask). Customer experience management is all about listening to your customers, analyzing what they say, and acting on the insights. However, none of this is possible without text analytics. Without text analytics, it would take thousands of hours for an individual to sort through and classify all of the customer data bombarding enterprises through social media, review sites, survey questions, and more. It would take even longer to aggregate all of this data and spot trends, detect the emotion (or emotions) of each comment, and assign issues to the correct part of your business. By the time you had that all done, the customer complaining about the pillows on his bed in your hotel would be long gone. But even if you know that text analytics is important to your business, you probably also know that there are seemingly countless text analytics and customer experience management vendors for you to choose from. How do you pick? Well, we at Clarabridge are very excited to share something that should make your selection process easier. 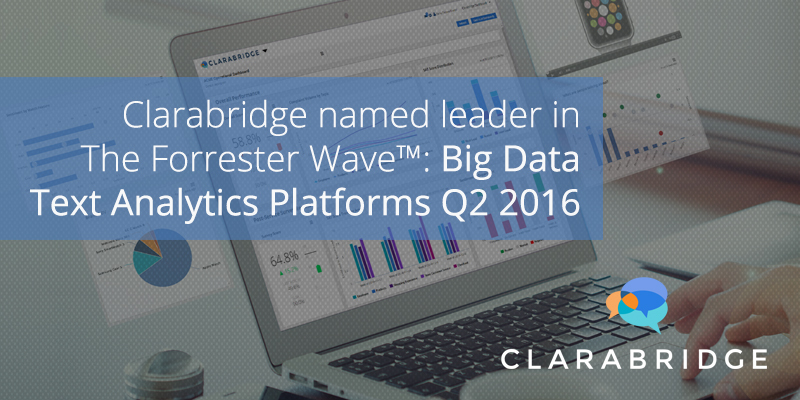 Clarabridge was not only identified as a leader in The Forrester WaveTM: Big Data Text Analytics Platforms, Q2 2016, but we were the only customer experience management vendor included at all. Additionally, Forrester gave us the highest score in linguistic text processing capabilities, user interface, delivery/deployment options, and customer satisfaction (strategy) – underpinning our commitment to superior products, ease of use, and ultimately, customer success. The significance of this Wave is twofold. First, our text analytics engine is so robust and accurate that it can stand up to other vendors who solely focus on text analytics or to large enterprise companies with significantly larger budgets. Not only can we hang with the big guys, we lead them. 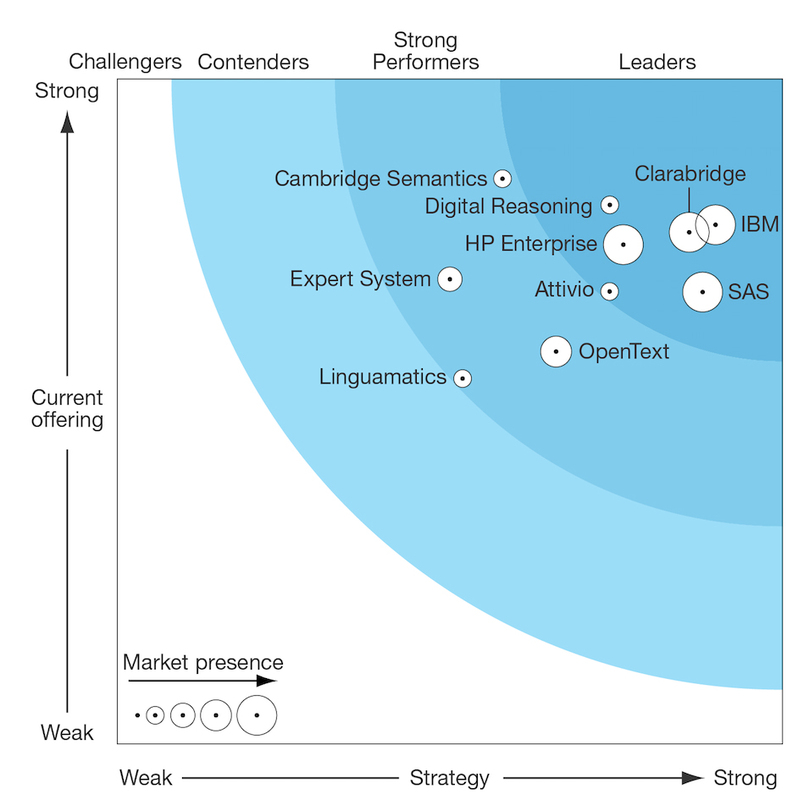 Second, after looking at more than a hundred vendors who provide text analytics in some capacity, Forrester only selected one customer experience management solution – Clarabridge. We think the message is pretty clear here. Text analytics allows you to make sense of what your customers are saying. Using a platform like Clarabridge lets you normalize and make sense of the thousands of pieces of feedback that you are receiving from your customers every day. This includes the unsolicited feedback coming in from social media and review sites, the unstructured data from your open ended survey questions, and so much more. Unsolicited feedback has become the major differentiator in many customer experience management programs. Your customers want to share information with you when and where they want, not only when it’s convenient for you. But, we’re not here to toot our own horn. We’re doing our text analytics happy dance. Using customer feedback to make happy customers is why we wake up each and every day. Without text analytics, there’s no way that you can understand your customer feedback well enough to make the changes that will not only create happy customers, but also bring your business a step above the rest. Kate Zimmerman is a Content Marketing Specialist at Clarabridge. Kate focuses on building content that supports CX efforts, product marketing, analyst relations, and has become an industry expert in Customer Experience Management. Kate holds a B.A in Politics from the University of Virginia and can be found on Twitter at @kmzimm.